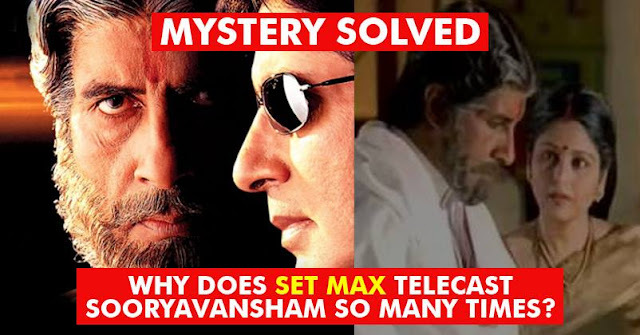 Sooryavansham is one of the most watched Indian movies of all time. Not because it is especially great or was commercially successful upon its release, but because it magically appears on television EVERY FREAKING DAY on Set Max channel. The 1999 movie, which stars Amitabh Bachchan in a double role, has become a cultural reference due to the frequency with which the channel telecasts the movie. The characters of the film – Heera Thakur, Gauri, Major Ranjit, Radha, etc. have become household names and many jokes about this flick have been circulating on the social media. And now for the first time, it has been disclosed as to why the movie is shown so frequently on the channel. But now, finally, we have an answer! According to a highly followed Quora user, Sony Max has purchased the rights to the film for 100 years. And by that logic, becomes obvious that the movie will get repeated telecasts. Well, does this means we have to watch the movie for another 83 years?! Enjoy the movie today as well on Set Max.